I did have time to knock out one quick project. 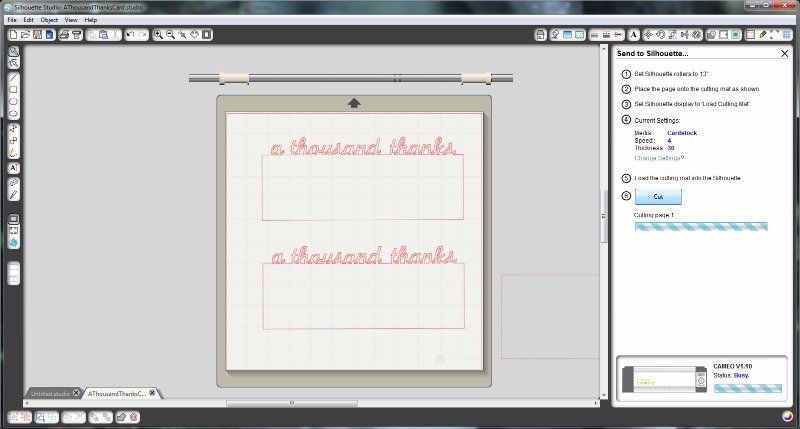 Lauren from The Thinking Closet offers a free Thank You card cut file over on her blog. It’s super cute, and the card can fit into a legal size envelope. You know, the kind that I always have on hand but no cards ever fit? I needed Thank You notes anyway, so I decided to cut a few out using her free cut file. My Cameo came with cute Metallic Sketch Pens, too, so I knew that I wanted to incorporate those. 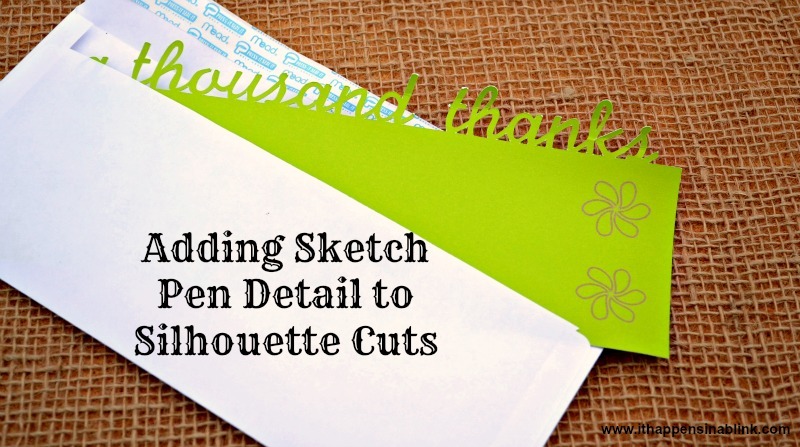 It was SUPER EASY to add the sketch pen detail, and while it probably doesn’t need an explanation, here’s how I added Sketch Pen Detail to an already existing Silhouette Cut. Cut your image however you normally would. In my case, I cut two Thank You notes on a page. Reload the same paper without changing anything. 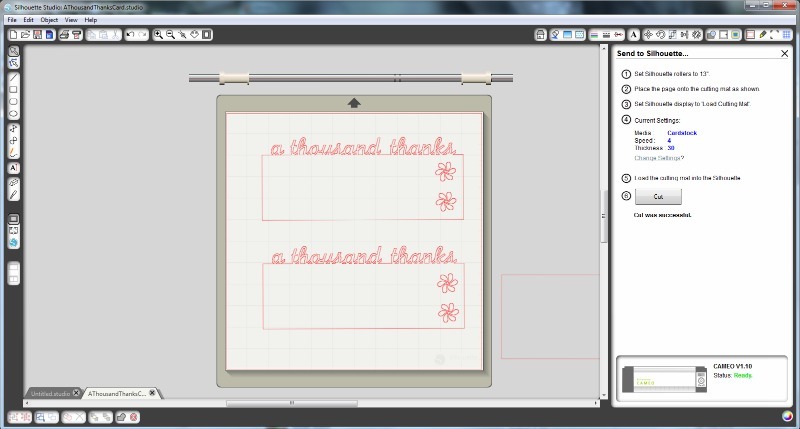 Go back to Silhouette Studio and add the detail that you would like “Sketched”. Once this is placed, delete the shape that you previously cut so that only the image to be sketched is left behind. Change out the blade for the sketch pen. Send the image to the Silhouette. Voila! My Thank You notes now have a cute sketched detail. I played around with the sketch pen colors and paper. The bronze sketch pen on green paper was my favorite. Visit The Thinking Closet for the card download file! Do you have a Silhouette? Would you like to participate in the Silhouette challenge? Simply contact Lauren from The Thinking Closet by email. These look awesome, Melanie! I stil haven’t really used my sketch pens yet – I need to start experimenting! Yay! Melanie I’m more than flattered that you decided to use my cut file to make some thank you cards. The colors you chose are awesome! And now you’ve inspired me to add some sketch pen details to my cards, next time I make them. Look at this fabulous cycle of inspiration! So glad you participated this month and congrats again on winning the giveaways! So exciting. Great idea! This has inspired me to use the sketch pens more often! those came out so pretty- I love that you can add sketching to it after the cut too! Hi Melanie, this is such a great tutorial for adding little details to the cut files. Especially if you meant to do it with the print and cut feature, and forgot! 🙂 I love the white on the pink, I think that’s my favorite. Also, lucky YOU to win two Portraits!! Wow! Glad you’ve joined the Silhouette Challenge group. Looking forward to seeing more. Have a great day! These turned out great! I haven’t given the sketch pens a try yet but I love what you & others have done with them. They look versatile. Great idea using the sketch pens to add some detail. I have the metallic set as well and I love how they turn up, especially on black paper. My only beef is that they run out of ink pretty quickly. Can you please tell me what the size (mm width and length) is of these sketch pens?